Gerry was born profoundly deaf and uses British Sign Language (BSL) as his first language. Married to Kay, they have two bilingual daughters. The next challenge Gerry has set himself is to complete a non – stop, round the world pass of the five capes, a journey made famous by likes of Sir Francis Chichester and the legendary Sir Robin Knox Johnston. Starting from the Firth of Clyde, Gourock on September 2012, and Gerry will then head for South Africa via the doldrums, Australia, New Zealand and South America. Modern communications technology will allow the press and public to watch Gerry enroute, follow his progress and view his blog entries. Gerry was the world’s first deaf yachtsman to sail across the Atlantic Ocean in the Original Single-handed Transatlantic Race in 2005. He is now preparing for the biggest challenge of his life – to become the first deaf yachtsman sail around the world alone. 1525 people have been to the top of Mount Everest. 560 people have been up into Space. 300 people have sailed past all five capes single-handed. Not one Deaf person has passed all five capes in single handed. He has spent years dreaming of sailing the world, years of wanting to rise to the challenge, and now the time has come!! One - Gerry has successfully circumnavigated the British Isles. Three – Gerry is now determined to take up the ‘One More…’ challenge and become the first deaf yachtsman ever to circumnavigate the world, non-stop… alone. In 1969, Sir Robin Knox-Johnston became the first man to sail around the world single-handed, non-stop. 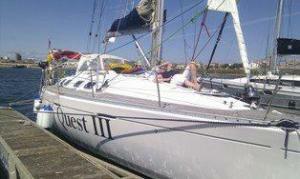 To fulfil Gerry’s lifetime ambition to be the first deaf person to sail around the world single-handed, non-stop. To inspire young deaf people, by demonstrating that they too can overcome many of the obstacles they face in life.